I need more music like this. I’ve got parties to plan! Sometimes, typos are not glaring–until they’re glaring. Know what I mean? Wha? I’m actually using purple in my color palettes now. Am I sick? I’m losing it. Must be. I hate purple. Or maybe I’m intimidated by it. It’s about the 5th time since I’ve listened to “Citizen” tonight. I live in Midtown Memphis and I usually keep abreast (what a stuffy word) of all things Midtown, but this golden-multi-colored-pom-pom stump, has me stumped. It sits at the corner of Higbee and Cooper street just across from Peabody Park. I’m not sure if this is an Urban Art Commission project like Greely Myatt’s “Tin Quilts” downtown, or if this is the doing of the local Knit Mafia (I’ll have pictures later). I don’t remember seeing it a couple of days ago. I wonder who did this? Oh well, until I find out, I’ll just continue to admire it from the sidewalk, unlike today when I tried to cross rush hour traffic to get a close-up and almost got hit. Anything for the arts! Right? 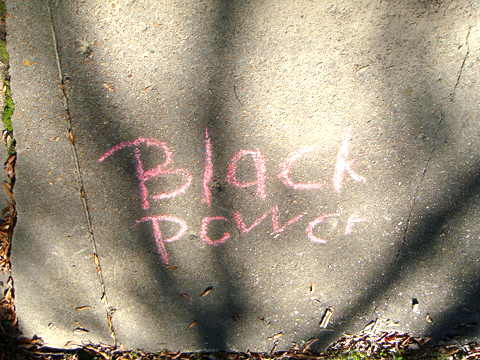 So this is how culturally advanced Memphis is: I woke up this morning to a vandalized car, someone scribbled “Ken” on my passenger-side window in chalk, and the icing on the cake, in front of our house, the words “black power” and “A-Town” written in chalk on the side walk. 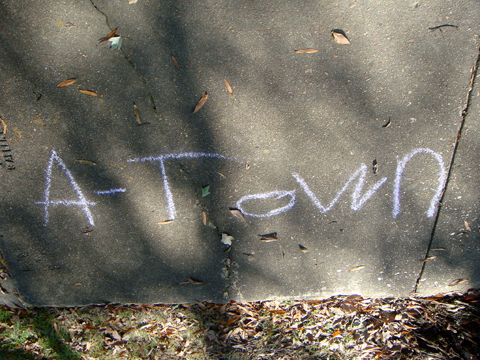 Totally don’t know what “A-Town” meant, not trying to figure it out; but, “black power”? 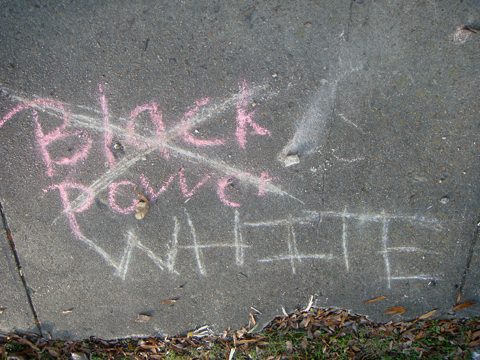 I didn’t notice this sign anywhere else on our heretofore lovely, racially-progressive street. Nothing boils my blood faster than intolerance, racism, and one of the most offensive holidays of them all, All Hallows’ Eve. I’m upset. We mind our business; we try to live a quiet life. Maybe I’m too upset. I mean, whoever did this is a coward who was obviously in prankster mode and was probably drunk (maybe not). I’m not even sure if this falls under the umbrella of racism. I know other people have more harrowing experiences to tell. I should just be chill about this. I’m not surprised, after all this is Memphis. So in honor of this stupidity: Ken, I’ve got an idea for next Halloween, why not scribble a noose in front of my door, with yellow chalk. Or a burning cross. That should get the point across. Gosh, I can’t get enough of this great city! Long live Our Blessed Lady Memphis. How quickly hate, ignorance spreads. This is what awaited me when I returned from the meeting. All of our neigbhors have been passing by this sign and looking at our house. Maybe they think we wrote this. My latest visit to Ernestine & Hazel’s last week, went something like, but not entirely, like the photo below. It’d be cool if Debi and I could have a going away party here. Right Dukes (as you suggested)? Good music, cold drinks and beer-flavored donuts. Ummm hmm.